At Perfection Tire, we always want to take care of your tire and service needs. 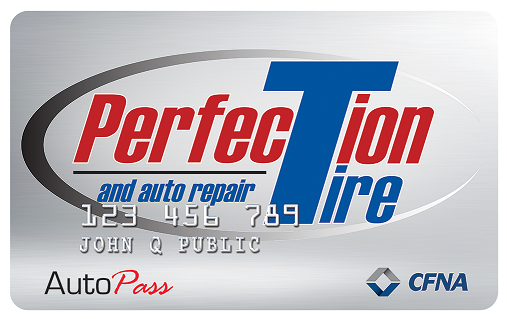 The Perfection Tire credit card offers no annual fee and allows you to charge everything from major repairs and scheduled maintenance to a wide selection of name-brand tires for your car, van, truck, pickup or SUV. *MINIMUM MONTHLY PAYMENTS REQUIRED. Applicable to purchases made January 1 through December 31, 2018. APR: 28.8%. Minimum Finance Charge: $2.00. CFNA reserves the right to change APR, fees and other terms unilaterally.